to build a durable brooder that we could us over and over. 4' x 8' exterior plywood. The bottom measures 60" long x 34" wide and 14" deep. We screwed the box together for added strenght. 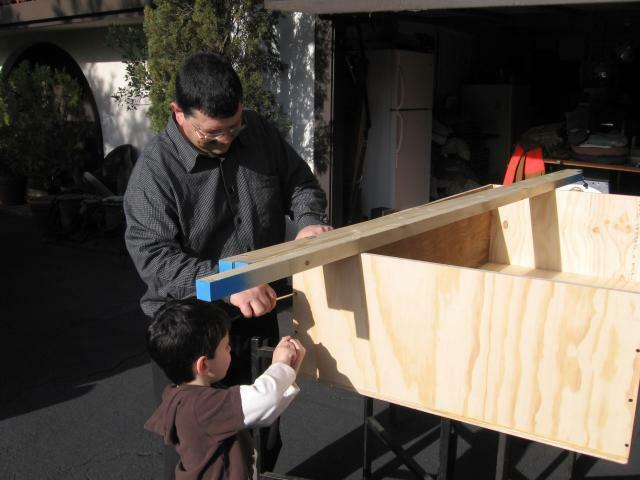 We then built the upper portion of the brooder. We used 2" x 2" x 8' lumber. 8 Pieces in all. fit inside the bottom box without any gaps. so that the visibilty would be better.The top portion measures 28" tall. We started the slope for the door 19" from the back. the edge of the lower box. The front door runs the full lenght of the brooder. It is attached at the top by 4 hinges. great access to the inside of the brooder. It took took 2 full days to construct just because of the tight fit we tried to acheave between the top and bottom. It really needs to be very square. That takes time. Over all it cost about $125.00 to construct. Wi_Pida, N F C, Kseale1986 and 7 others like this. I made this brooder several years ago and since then it's raised many many fuzz butts ranging from chicks to goslings and everything in between. "How easy is it to clean?" I love this brooder box!! I had two of these built for me!!! I love them! This brooder has LIVED in my house for months..... so great and holds lots of chicks very handily. Thanks for sharing the design!!! Nice brooder. I like the design! I built this brooder for our chicks over Easter weekend. It's great, but now they are itching to have a coop to live in. Thanks for the great idea and pictures! really nice. this is going to be my new brooder!!!!!!!!!!!!!! Beautiful job! I've been pondering what I'm going to do with 30+ chicks coming in May. I didn't want to have to go through multiple "brooders" to house them as they grow, and didn't want to have to separate them. I think this will fit the bill perfectly (8' long)! Was going to start building the coop this weekend, but I guess this will be required first, so change of plans! It will be good to be building SOME thing! Will help keep my mind of the wait for the chicks to arrive. Thanks for sharing your brooder! Wow!! That's a amazing brooder!! I'm defiantly thinking about building this for myself. 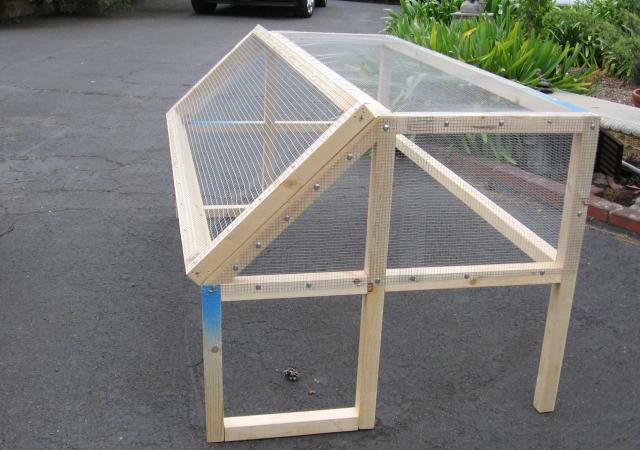 I'll just build it a bit smaller because I only house a maximum of 10 chicks per brooder. Otherwise they'll develop a pecking habit. Good job! Just made this brooder, almost exact I believe. Can't wait to get some babies in it!!! i plan to make this, im not sure on how big but, ill make something like this, its perfect. Can you do this but make it smaller? Great design. love the hinged front design!! I love your brooder! Such a great Idea.I really like the flip up door. this is really nice....good job. Nice design. I built one very similar to yours. I put our on caters to make it easy to move around. Love this design, only thing is I have a bad back, would be perfect if it sat up off the ground/floor. Very nicely done. I really need to build several large brooders this year to accomodate multiple hatches of chicks. Very nice,, looks easy to clean too. Love it! It's almost exactly what we had in mind and was very helpful to be able to refer to while constructing ours, though the dimensions are slightly different. 68 x 34 x 14" for the box with an overall height of almost 29" for the frame. I can't wait to be able to brood some chicks! It looks great, is very sturdy and should be simple to clean and use. Thanks so much for posting this! 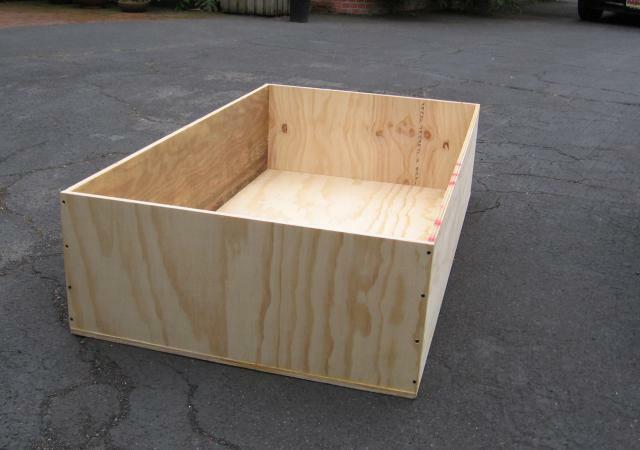 With this form as an inspiration, I built a 30" x 72" brooder box, with 2 compartments. It has come in handy for separating birds of diferent ages/sizes, and will hold about 25 chicks each side until almost ready for yarding. They get a little crowded with that many, but we move and adjust as we go. My box is built from salvage and sale materials, as always. The doors are the only things screened, and have some 1/4 inch drop in panels, and butterfly clips to hold them in place closing up about 75% of the screen for cold weather. The birds seem very happy iwth the windless design, and the low profile of the front makes for easing scooping of the bedding. My Brooder is in a very airy yard barn, and winds filter through it regularly. It got painted white, inside and out, and has a very clean look, even after some use. I love this plan! I am rotating my flocks out and currently have A LOT of chicks that will be hatching in a few weeks. We had lots of ideas of building an outside temp controlled incubating/brooding house next to our other coops. This is a great starting point for how things will be set up inside. I love having the baby chicks close in the house but with the numbers i am expecting im going to need a lot more space! This brooder is PERFECT! Goodbye dark tiny smelly totes...HELLO paradise! Thanks for the plans and pics. Anyway, love the look of it! My chicks should be hatching this Friday and Saturday if all goes well. Lockdown started tonight! Fingers crossed! 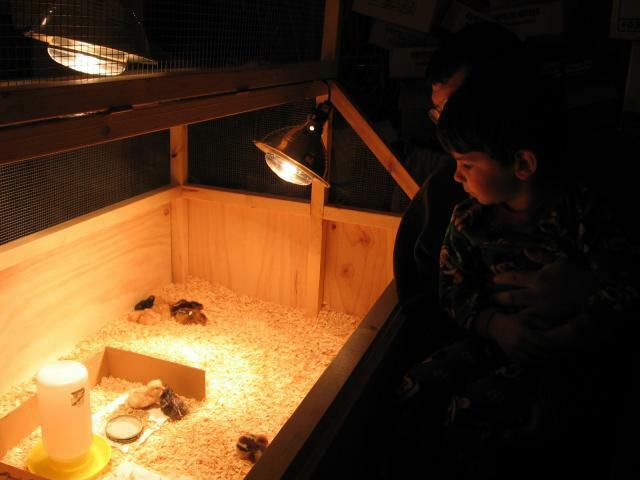 We got baby chicks while our coop was being finished off and the run built. I never thought chicks would grow as fast as they have been. After about a week and half, it was clear that the makeshift cardboard box they were temporarily living in would become way too small. I stumbled upon this site along with brooders that people have made. 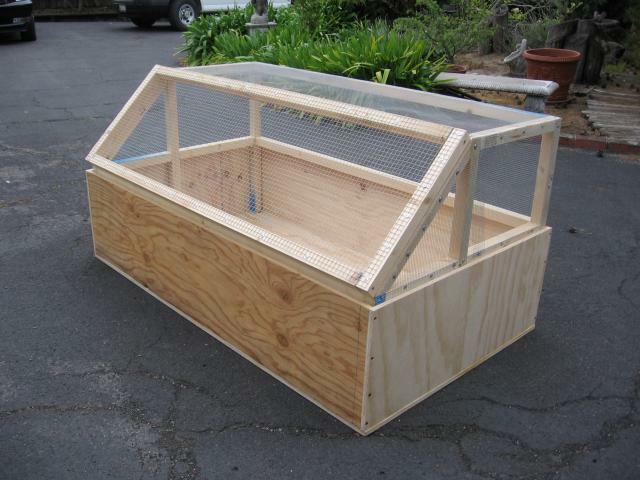 I loved the design of this brooder and put some time aside this past weekend to build a replica of this one. It came out great and my chicks will be moving in this afternoon!! The only modifications that I made were to add a handle to the door and one on each side of the box to make it easier to more/relocate. I also added a roost which can easily be taken down if used for other animals. Thanks for sharing your brooder!! It was a great little project and I love the design!! I love the design of this brooder. I think this will work very well and am going to have hubby build one for me. Nice job and attention to detail. I'm going to attempt one with some minor mods and some help. 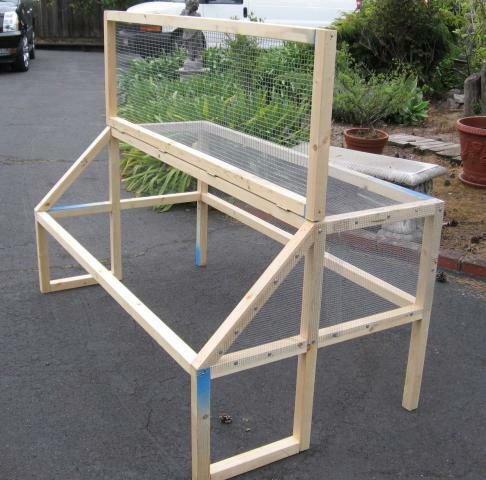 I am begging for my other half to make me one of these after i use it as a brooder i can also use it for my Salad garden and Veggies . What a useful Idea thank you so much for sharing . Nice Brooder! I am so jealous, I use a large Rubbermaid box with some wire cloth connected to a wooden frame on top. Thanks for posting the pics and measurements. This is the brooder I want to make. With a few adjustments, but still. This is amazing. Thanks for sharing! I love the style of this brooder. We are using it as a model for ours with some adjustments to fit our space and budget. We just got the material today and the first modification is we bought one sheet of plywood. We ripped two 12" strips from it. These will become our sides @12" high. This left a 2x8 strip which we will cut down so that our base is 2'x4'. That's as far as we've gotten so far. I plan to have an insert in the bottom with 1/4" hardware cloth on it so the chicks are on the wire mesh instead of the plywood. It will fit in the bottom of the box and removed easily. We intend to have this outside so we will paint it with barn paint (something we have on hand). We need to figure out something to weather-proof everything since it will sit outside. On cold and wet days, we need to have protection - probably will use a tarp. Oh, I'm going to have a chain to hang my light from. This will allow me to adjust my light height for heating needs. We are less than $30 into this with the lumber and hardware cloth. I love your brooder! Thanks for posting pictures and information! I love this brooder! It looks Nice! Nice brooder are those wyandottes? I made this one last year from your instructions and it is the best. That is a nice brooder. 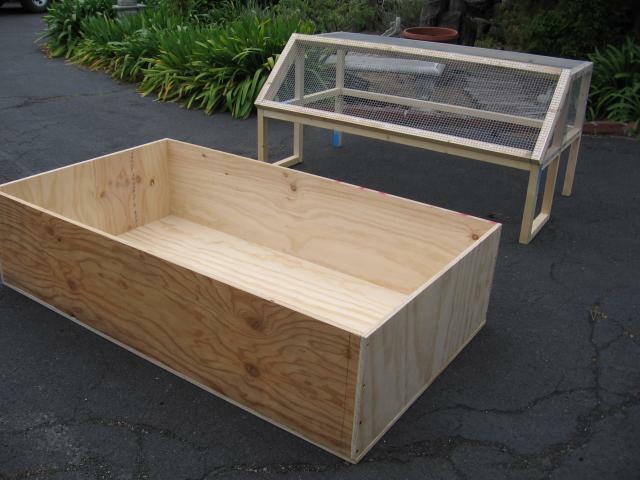 You could use it as a cold frame too- if you needed one- if you put plastic over it! I like this brooder. I am hatching to. What kind are those chicks?